Central Florida mourned the deaths of two teens in separate collisions just 48 hours apart in June 2015. In each case, the victims were not wearing seatbelts. Florida law requires that all passengers riding in the front seat of a motor vehicle must wear seat belts. In addition to this, all children under the age of 18 must be belted regardless of where they are seated. Four and five-year-olds are required to be secured in a child booster seat that is federally approved, and children three and younger must be protected in a federally approved car seat. Driving any motor vehicle without complying with these laws could result in a seatbelt violation. But the fine associated with these laws is nothing compared to the injuries that could occur when they are ignored. Seatbelts are the most effective tool we have to reduce injuries and save lives for adults and children who are big enough to be fitted properly. According to the Centers for Disease Control and Prevention (CDC), the number one cause of death for individuals aged 1-54 is motor vehicle crashes. In fact, 2014 saw over 20,000 fatalities in passenger vehicle crashes. More than half were not wearing a seatbelt at the time of the crash. In addition to these deaths, emergency rooms treated well over two million drivers and passengers that year, resulting in $45 billion in associated costs. What Makes Seatbelts so Effective? They keep vehicle occupants in the car. Being thrown from a vehicle results in four times more fatalities than being belted inside. The strongest, heaviest parts of the body, the shoulders and hips, are restrained, preventing injury. Belts spread the force from the collision. More serious injuries are avoided by reducing the stress on a particular part of the body. The head and upper body are protected from forceful contact with the steering wheel, dashboard, and other hard parts of the vehicle’s interior. Why Aren’t Seatbelts Enough for Children? Small children do not fit properly in adult seatbelts. Additionally, their skeletal structure differs from that of adults, requiring unique protections. Children under age one and/or twenty pounds should be secured in a rear-facing child safety seat. Forward facing car seats are designed for children over twenty pounds, and should be placed in the back seat of a motor vehicle. Children over forty pounds and/or 4 years of age are safe to ride in a properly fitted booster seat. This is appropriate until age eight, or being four feet nine inches in height. Riding in the back seat is recommended until age thirteen. There are plenty of excuses for not buckling up. Maybe you don’t want to wrinkle your shirt, or perhaps you’re going just a few blocks. And who hasn’t forgotten a little thing like that on occasion? The fact of the matter is, seatbelts save lives. Moreover, the law requires proper restraints. 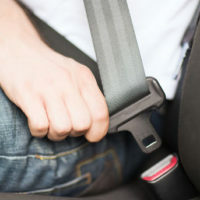 At the Law Offices of Robert W. Elton, we hope you buckle up every single time you get in a motor vehicle. Regardless of the circumstances of your accident, our experienced personal injury team will devote ourselves to securing the best settlement possible for you. Contact us today in Daytona and Ormond Beach for a free, confidential consultation.